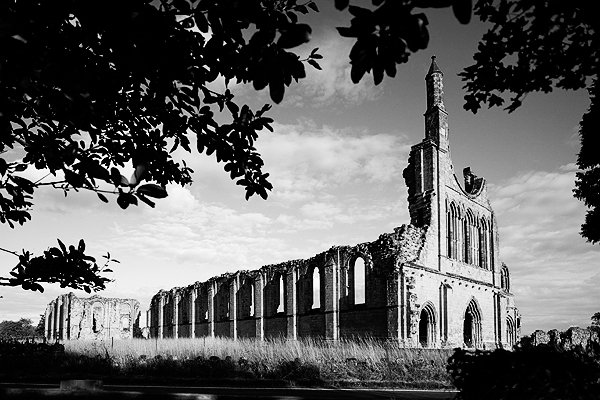 A romantic setting tucked away in a quiet valley; quite simply, the ruins of Byland Abbey and its surrounding landscape are truly breathtaking. Once one of England’s greatest monasteries, Byland Abbey inspired the design of church buildings throughout the north, including York Minster. Built in the 12th century by Cistercian monks, hospitality has always been a huge part of the site’s history. Now that hospitality continues as this magnificent Gothic edifice is available as a reception venue for your big day. Whether you arrive in a horse drawn coach, a Morris Minor or a red double Decker bus, the setting of Byland Abbey lends itself to any style of wedding reception. Picture yourself entering the romantic ruins, to be greeted with ice cold bubbly and mouth-watering canapés, then on to exploring the spectacular setting. Frame some of your photos with the entrance to the nave, topped with its spectacular Rose Window. Every corner offers beautiful settings to help make your wedding album special. There are two two marquee sites at Byland, one right in the central cloister area and one by the gate arch; marquees can be extensively tailored to suit your own requirements, catering for between 80 and 300 people. Alas, civil wedding ceremonies cannot be held at Byland Abbey however the Abbey is available to host wedding receptions. On the edge of the North York Moors, snuggled beside a majestic Abbey is a hidden gem perfect for those looking for a unique place to hold a wedding reception. Overlooking the majestic Byland Abbey, the Inn is steeped in history, from the medieval hostelry under the building’s foundations, to its beautiful stonework borrowed from the Abbey and the Inn’s final transformation refurbished from the 19th century farmhouse it once was. The Inn offers a classic romantic setting for your wedding with a choice of informal elegance in the dining rooms or a stunning marquee reception in the grounds – perfect for groups of 20 up to 80 inside, or up to 200 in a marquee in the grounds. Recently licensed to hold civil ceremonies, enjoy your perfect day before settling into one of the lovely rooms for your wedding night. Black and white image above copyright of Martin Bignell All rights reserved. Please do not use images without prior consent.